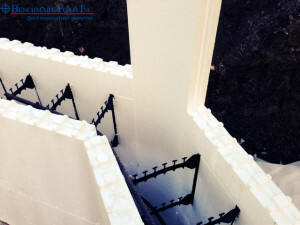 Although it’s not a new concept to integrate 45-degree corners with Insulated Concrete Forms (ICF), there is a new design from Benchmark Foam that saves installation time. The new design is a custom cut, one-piece corner that slides flawlessly into the interlocking tongue-and-groove design of Benchmark ICF. The new corner supports design flexibility while eliminating the corner tie and hassle of attempting to field cut a piece to fit the plan. Maintaining the same physical properties of Benchmark ICFs, the corner pieces come in 4’ sections, but can be customized to fit any design. The versatility of the 45-degree corner piece offers designers the freedom to include ornate features on structures, yet still offer an easy installation. For more information on the new 45-degree corner piece, call us at 800-658-3444 or 605-886-8084.